“BlacKkKlansman” Spike Lee back on form and funny with it. “Bohemian Rhapsody” Cheesy crowd-pleaser even has a ‘Beethoven composing’ moment and shouldn’t be here. “The Favourite” History, fact or deranged fan-fiction? It took me a minute to figure out the final shot. “Green Book” Souped-up ‘faction’, worth it to see Mortensen eat an entire pizza in one go by folding it in half. 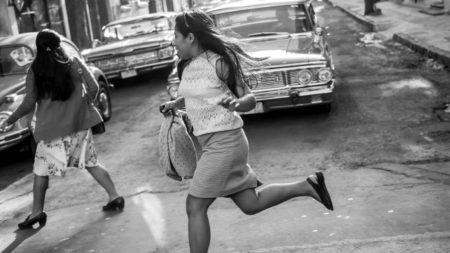 “Roma” – Both touchingly intimate AND a sweeping epic – how did he do that? It has to win. “A Star Is Born” – Saw the Garland version, it was better. “Vice” – A flashy, smart lesson in politics as a destructive force, in case you thought now was bad. Sam Elliott, “A Star Is Born” Which one was he? Sam Rockwell, “Vice” Which one was he? Marina de Tavira, “Roma” Which one was she? Of the others, Pawel Pawlikowski deserves best director for “Cold War” but Alfonso Cuarón should also win for “Roma”, for returning film to grandeur. Among the animated features there can be only one winner, “Spider-Man: Into the Spider-Verse,” for allowing form to dictate narrative – a genuinely startling game-changer. In terms of script my personal favourites were the same as the nominations, “The Favourite,” by Deborah Davis, Tony McNamara, “First Reformed,” by Paul Schrader, “Green Book,” Nick Vallelonga, Brian Currie & Peter Farrelly, “Roma,” by Alfonso Cuarón and “Vice,” Adam McKay. Cinematography has to go to “Roma,” but now there’s a problem with Best Foreign Language Film because “Roma” is nominated here as well. I feel sure that Production Design will go to “Black Panther” even though it comes from designs in a 1960s comic book. Best Original Score is a joke this year, with none of the truly superb scores like Max Richter’s ‘Mary, Queen of Scots’ or Justin Hurwitz’s surprising mix for “First Man” featuring. Costume Design must be “The Favourite” from the ever-amazing Sandy Powell. The no-shows are as usual a shock. No ‘Stan & Ollie’, no ‘Three Identical Strangers’, no ‘First Man’, no ‘Widows’, no ‘Burning’, virtually no ‘Mary Poppins Returns’. Hey, it’s the Oscars – they always say more about the times than the films. I think the choices say more about the film industry and the difference between what people think and how they think they should think, or the idea that we need to set a good example. To be honest I stopped paying much attention to the Oscars long ago.